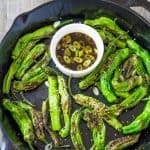 These gluten-free pan blistered shishito peppers take less than 5 minutes to make and will spice up your day! 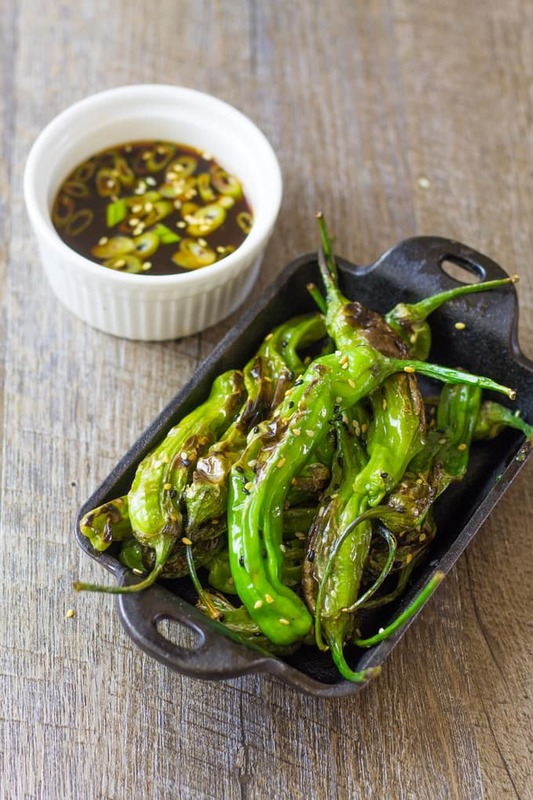 If you are looking for a quick snack to spice up your day, or your night, then check out my pan blistered shishito peppers. Not to mention that you will be getting your servings of veggies!! For the last few years, I have been seeing shishito peppers all over the internet. Ok, I really see them all over Pinterest boards because I am on it ALL THE TIME. Unfortunately, I have never had the pleasure of eating a shishito pepper because they don’t have them in Waycross, GA. Kind of like the Hatch Chilies I have been drooling over but have always been out of reach. UNTIL NOW! My first taste of shishito peppers was at my new favorite place to eat in Scottsdale, Arizona, Sumo Maya. A Mexican/Asian/South American Fusion restaurant that serves small tapas-style plates. Right up my alley!! You can get the most amazing sushi alongside mouth-watering tacos and hand-crafted cocktails. A wonderful selection of tequilas and margaritas right next to a long list of available sakes. 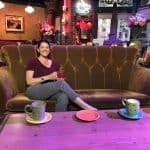 Want to join me for a night out? Sorry for my tangent there but I just love this place so much! Back to the shishito peppers. One of their small plates that I love is their shishito peppers. They serve them with bonito flakes and a pumpkin seed sauce. Perfectly blistered and yummy. This is my starting point for making my own shishito peppers. 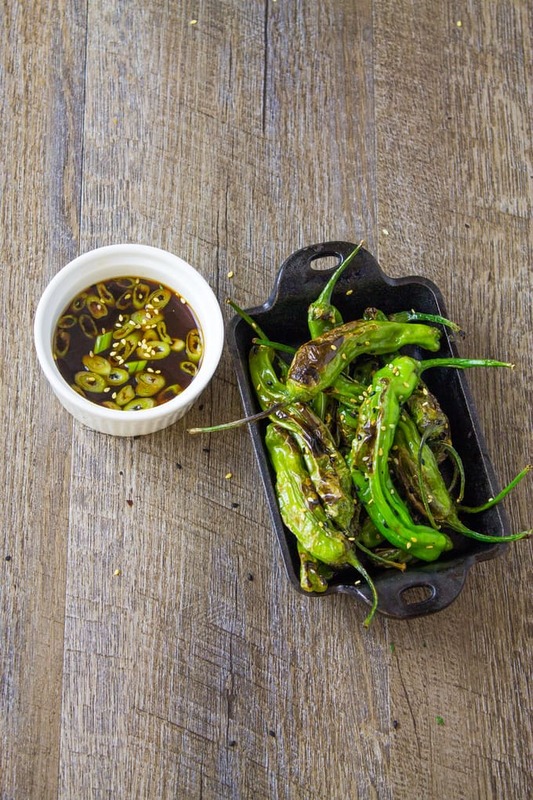 At Sumo Maya, they sear their peppers on the flat-top or plancha. 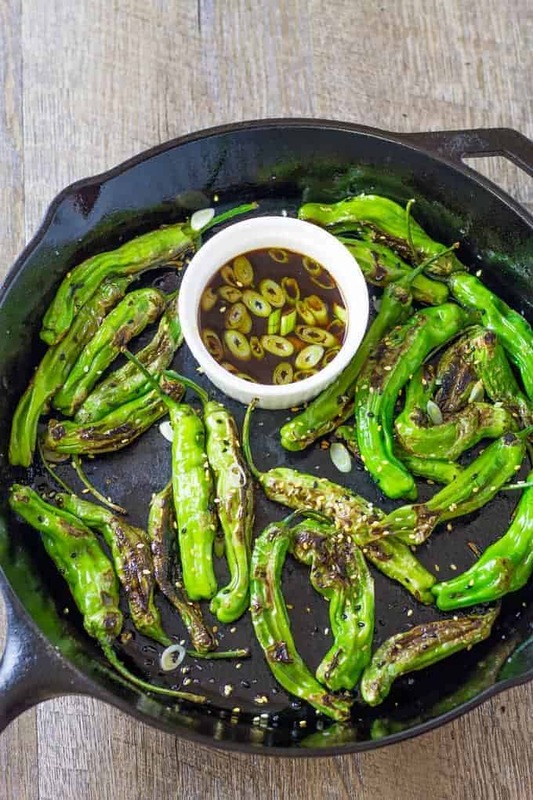 I am dreaming of the day that I can have a plancha in my kitchen so I can make these shishito peppers, the smoking onion towers you see at the choppy-choppy restaurants, and 30 quesadillas at one time for when I am really hungry. But, alas, I don’t have one so I will stick with my trusty cast iron skillet. Now when I thought about how to cook shishito peppers I had a few ideas. I can cook them on the grill when we fire it up but they tend to fall through the grates unless I have a grill basket. I can blister them in my screaming hot cast iron skillet. The last one is my favorite mostly because I am partial to my skillet. The more I use it, the better it gets! 5 minutes is all it takes! Get your pan screaming hot, toss your peppers in some oil, and then throw them in the pan. Stir the peppers around, flipping them every so often, until you get beautiful blistered shishito peppers. Say that 5 times fast…It is perfectly ok that they are not evenly blistered all the way around. You really just want some char on them and heat them through. It is perfectly ok that they are not evenly blistered all the way around, you really just want some char on them and to heat them up. The heat of the peppers comes through as you sear them because you are blistering them whole. Do not stem and seed them beforehand because those stems make great “toothpicks” to use to get them to your mouth and the whole process is too time-consuming. A lot of shishito pepper recipes have a creamy dip to go with them. The ones I love at Sumo Maya come already dressed in a soy pepita sauce that is sweet, salty, and oh so perfect. They won’t give me the recipe so I went with my own sauce. Not a creamy one mind you as I want to keep the flavor of the shishito peppers as pure as possible. My ginger ponzu dipping sauce is a simple mixture of Ponzu, minced ginger, and a dash of Sriracha. If you are already sweating from the heat of the peppers, feel free to leave out the Sriracha and just use the ponzu and ginger. Now, these are a snack I can eat by the bucket full. Too bad the shishito peppers only come in 6-ounce packages here. I guess I should be thankful to get them at all and not complain about the package size. You’ll be eating your veggies and they are gluten-free! 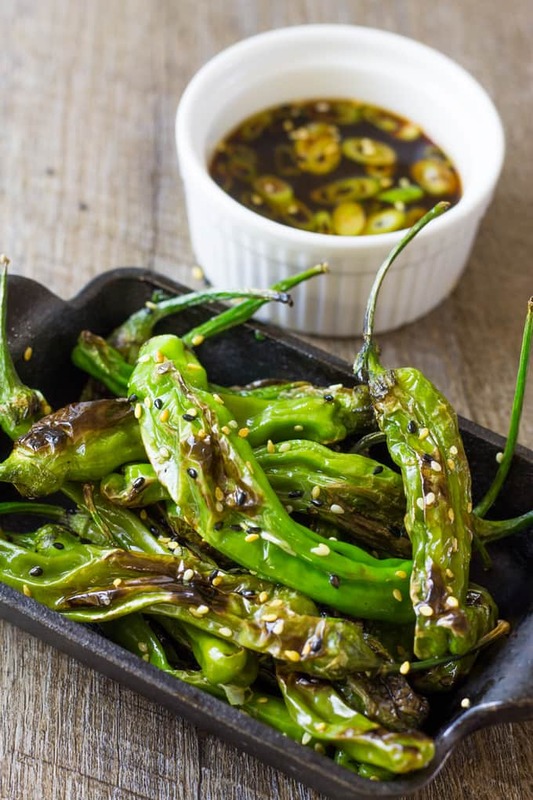 If you are lucky enough to come across some shishito peppers in your grocery store or farmers market, grab them quickly and pan-blister them for an amazing snack! Did I mention that they are veggies and gluten-free? 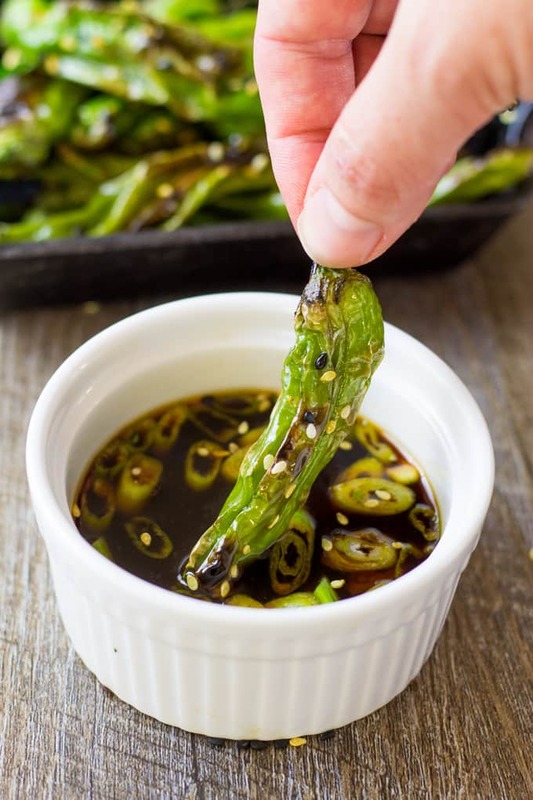 This gluten-free pan blistered shishito peppers recipe take less than 5 minutes to make and will spice up your day! Get your 8-inch or larger skillet screaming hot on the stove top or grill. Toss your shishito peppers in the oil. 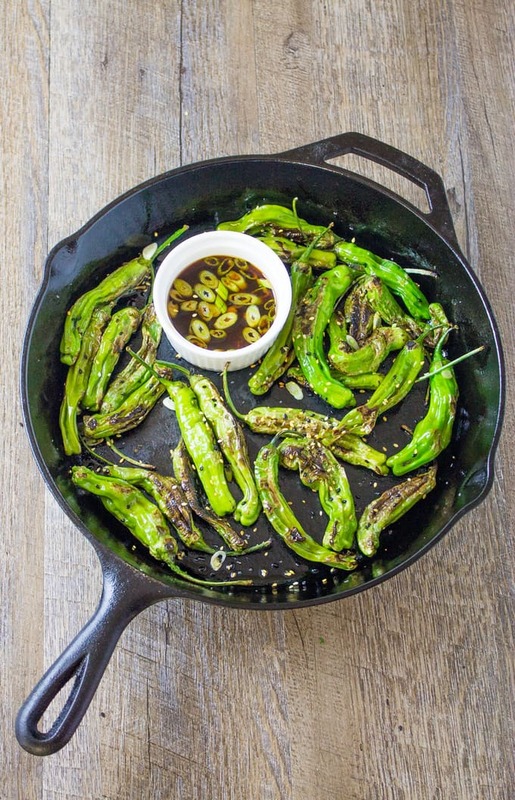 Add your shishito peppers to the pan and stir or shake them around for 4-5 minutes or until they are blistered and charred. Remove from the pan and place on the serving dish. Mix together your dipping sauce by whisking together the ponzu and minced ginger. Add your sliced green onion for a little flavor boost and to make the sauce look pretty. Enjoy your shishito peppers warm or at room temperature. I’ve never had Shishito peppers but am excited to try them. I love my skillet too!